"What Matters and What Doesn't..."
It's an old story, this one, and one with roots not in malice, but rather, youth and ignorance. It is when I first began to discern what mattered and what didn't in ministry. I was a young pastor serving a small, rural church. The people there were kind and they were kind to their pastor. When I began my ministry there I quickly learned it was their practice to simply come forward for communion in a line, to stand before the pastor who gave them the bread and the council member who held the chalice of wine, to receive the sacrament, dipping the wafer into the wine and then move on, making room for the next one in line. This is fairly common practice today. In the late 1980's, in my experience, not so much. It never occurred to me then to even ask why they did this. Looking back now I find my lack of curiosity striking, but that also may just have been a result of my youthful inexperience. And so it was that when our first Lent together rolled around I thought to suggest another way...that for the season leading up to Holy Week and Easter perhaps we could celebrate the sacrament instead by kneeling at the altar and receiving it by 'table.' Lent, after all, is a season of penitence, and kneeling would seem especially appropriate then. To be sure, this was fresh in my mind from a recent seminary class and being a 'newly minted' pastor I was eager to serve faithfully in the ways I had been taught. And so on the first Sunday in Lent we knelt for communion. Again, remember these were kind people and they had a deep respect for the office of pastor and so almost without exception they would accept the pastor's suggestions even if they were dumb. I'll never forget that morning as the good people of St. Paul Lutheran Church did as their pastor asked. Winifred, the matriarch of the congregation, sat on the right hand side near the back. She was a round faced woman whose wrinkles had been etched from years of smiling. Indeed, she was not young and her knees were not what they used to be. After most of the rest of the congregation had come forward, Winifred made her way to the front as well and knelt with all the rest. I remember wincing to watch as she struggled to get up again. And it hit me that this was why the people of St. Paul Lutheran Church did not kneel to receive the sacrament. They did not do so out of kindness. If Winifred could not kneel, then no one would. The next week we quietly returned to standing as the bread and wine were shared. The questions, of course, are indirectly posed by this week's Gospel. "Why do we do what we do?" "Is it rooted in God's intent for us or is it simply our 'human traditions' which guide and inform us?" "What matters and what doesn't?" Now to be sure a lot of our 'human traditions' may well be rooted in a great deal of good. Although they are far outside my own experience, and I would be hard pressed to explain them, I am certain this was also true of the practices observed by the Pharisees in today's Gospel lesson. Only Jesus would remind us, along with the prophets of old, that what we speak or the rituals we keep mean nothing at all if our lives are less than charitable. In the same way, while what we do on the outside can enhance our faith, such practices also may have no bearing at all. It is, finally, what comes out of us that is a truer reflection of who we are, not what goes into us. It's not the same thing, of course. Kneeling to receive the sacrament is not the same as the hand-washing rituals practiced by the Pharisees. And yet, perhaps the point is the same in the end. For I expect Jesus was happier with the people of my first congregation for their kindness than he would have been had they continued to kneel simply because it had always been done that way. One, of course could argue that they went overboard, that just because one couldn't kneel doesn't mean the others shouldn't. Still, I have always thought of their collective ritual action as simply kind. And I've never forgotten the lesson learned that season about paying attention and going deeper and raising questions about what matters and what doesn't. What do you make of Jesus' conversation with the Pharisees this week? How do we receive these ancient words and find meaning for them in our lives today? Can you think of examples of when what we've always done no longer works today? How do you think about what matters and what doesn't? In the life of your congregation? In your own faith journey? What are the 'human traditions' which have marked and shaped your life of faith? What might you be called to reconsider? "You Have the Words of Eternal Life"
"Lord, to whom can we go? You have the words of eternal life..."
I almost cannot read those words without singing them. For you see, as long as I can remember I've been part of a community of God's people among whom these words are sung just before the Gospel is read every time we come together. "Lord, to whom can we go?" And yet, the flip side of their familiarity is that in some ways, I suppose, they have become rote. In fact, I expect there are many days when even as I join in singing them the words and their meaning slip by me. Perhaps this is true for you as well. Still, there are times when those words sing in our hearts so deeply that with our whole being we find we yearn for those words of eternal life only Jesus brings. This was mine to know on Wednesday of this week for we had traveled to Duluth to attend the funeral of an old friend. When I first received the news of Antti's illness my grief began and it intensified over the weeks as I heard how quickly it took its toll. Quickly, though, I discovered my sadness was interrupted by gratitude for I found myself remembering what a gift this one had been for me. For you see, for reasons beyond my comprehension, Antti believed in the gifts God had planted in me before I did. He helped me find my way to seminary, stood behind me as my ordination sponsor to drape the red stole around my shoulders, taught me what it was to be a servant leader, always took my calls and gave what he could in my early years as a pastor. Only a year ago he and his wife took me to lunch, leaving with me a bag of books he hoped would help sustain me on the journey. I have been blessed beyond measure by the gift this pastor/mentor/friend has been to me. It is no wonder I grieve his final illness and his dying for this world somehow seems smaller without him in it. The words of eternal life that Jesus has for us are never more precious than in times like these. And so it is that I am so very grateful to be able to say that those words were shared in a myriad of ways at his funeral this week. In the hymns and lessons Antti carefully chose for us to share in that hour. In the preacher's gift of proclamation, reminding us of the nearness of God. In the cross that preceded the procession from chancel to cemetery. And once more again at the cemetery itself when after the final commendation, the workers were called over to lower the casket into the ground. Now I have been a pastor a long time, but I can only count on the fingers of one hand how often I have seen this done. We paused together: family, friends, neighbors, former parishioners, area pastors all together on a hillside in Duluth and stood still just a while longer as they did what they normally do only after the mourners have left. We could hear the squeaking of the crank as it slowly lowered the casket holding the body of our dear friend into the ground. And then his pastor began to sing. Only a few words had found voice and melody before the rest of us joined her in singing "Children of the Heavenly Father" --- all three verses from memory. There was comfort in that sound surrounding us and embracing us then as we claimed for ourselves the words of eternal life. There was also yearning I thought. For even as we strive to stand firm in the promises of God, we do so knowing we have not yet experienced those promises kept in all their fullness. 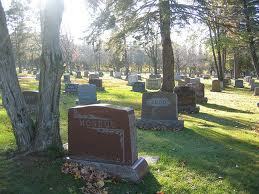 We yearn for words of eternal life in part because the evidence of death is so very present. We stand in faith and hope, but not yet in hope fulfilled. Indeed, in some ways, like the disciples so long ago, while we believe and have experienced that Jesus holds the promise, still we don't yet fully know what the promise will one day mean. The story of how this last winter --- before he was diagnosed --- Antti ordered a casket kit. He wanted to piece together his own final physical resting place with his own two hands. We were told how the box sat in the garage for several months -- but the day after his diagnosis he and his son and a friend pulled it out and put it together. He was showing us what it was to put his faith in Jesus' words of eternal life in accepting the inevitability of his own death, believing it would not have the last word. I saw it in its finished form on Wednesday. His body lay within it --- cradled by the quilt his daughter had made for just this. The moment a few weeks ago when his seven-year-old grandson asked, "Papa, after you die, how long will it take you to get to heaven?" Papa's answer was, "One step." Antti answered, of course, not in the language of time but of space and in those two words I hear something of the very nearness of God and all of God's wonderful gifts. For him then and for all of us. won't you come then, Jesus, take me in your lap? hold me like a small child, ready for a nap. And finally of course, a few days later in the voice of a group of believers brought together in our common grief and in our shared hope, standing on a hillside at the grave of a loved one singing of God our Father who one day will gather us all into his lap. To be sure, today I find I am especially grateful to be part of a whole community of God's beloved children who together yearn for the gifts of Jesus. For we notice that Peter does not say, "Lord, to whom can I go?" He says rather, "Lord to whom can WE go?" Some of us walk ahead leaving gifts of witness and hope for the rest of us to pick up and carry and pass along as well. As Antti has. Others stand alongside us and sing together our yearning and hope in the face of death itself as so many did with me a few days ago. Others still come after, looking to us to lead the way as together we turn once more to Jesus repeating the words, "Lord, to whom can we go? You have the words of eternal life." Indeed, I almost cannot read these words without singing them --- as I have my whole life long in the community of yearning, hopeful believers. To be sure, we do not do this alone. Thanks be to God. When did you last speak these words, "Lord to whom can we go?" with a heart full of yearning and hope? How was your yearning answered? What examples do you have of people who have accompanied you on the journey, helping point the way to Jesus, the Holy One of God? What has their witness meant to you? When have you been especially grateful that this question comes from all of us, not just you yourself alone? How has the community of God's people strengthened you in those times? One could say it was a children's sermon gone wrong. A few Sundays ago as we were talking about Jesus feeding the 5000 we did an 'experiment.' I had the end of a loaf of sourdough bread left from baking on Friday and we decided to pass this piece of bread among those gathered for worship that day. I broke it into three pieces and then sent three youngsters out into the congregation with it: one small piece for the right side, one for the left side and one for the balcony. As the people passed it from one to another, they were invited to take a piece for themselves. It took a while for those bits of bread to make their way up and down the pews... and as for the balcony? Well, in the congregation I now serve it's a far distance from where I stand --- so I couldn't really tell how it was progressing there until laughter started rippling down. I looked up and asked what had happened. Several shouted out that they would tell me later. Still, it was clear that something had happened to their portion of bread. So having a little left from one of those which had made its way through the main floor, someone ran upstairs with it and everyone in the place wound up getting a piece of bread. A small piece, to be sure, but still at least a few crumbs. I followed up later with the balcony crowd and learned that there was a three-year-old accompanying his grandma at worship on Sunday. When the bread came to him, he popped the whole piece into his mouth! It is also so with the bread that is Jesus --- this living bread which comes to us from God's own hand. promises life. It is ours to receive, to enjoy, to celebrate, to give thanks for. And like all bread, it is meant to feed us. I was on call at our local community hospital a few weeks back. It was mid-morning on Thursday when my cell phone rang. It was the hospital social worker calling to tell me she was with a family whose 90-year-old mother was dying and they had asked for pastoral care. It wasn't urgent, she assured me, but hospice had been called in. Then almost as an afterthought she said, "The language shouldn't be a barrier. Her children know enough English so that you should be fine." So off I went. I stepped into Carmella's darkened room and introduced myself to a handful of sons and daughters and daughters-in-law. They spoke of their mother and her deep faith. This was evident from the rosary tucked into her hand and the prayer card laying next to it. They spoke of how close she was to death. They spoke of her other children still on their way. They spoke of their grief and of their wondering if the others would arrive in time. And so we gathered round Carmella's bed and with my hand on her forehead I prayed. It was in the next moments that one of Carmella's sons turned to me and asked if I would bring them communion. "Of course," I said. And I drove back to church and refilled my communion kit with plenty of wafers. I loaded up the little plastic glasses just in case, although as I expected, their practice was to receive only the bread. I returned within the hour and by then most of the family had gathered --- crowded around the bed of their mother and grandmother.... I repeated the story we hold in common, "In the night in which he was betrayed, our Lord Jesus took bread..." I wish I could have said it in Spanish...even so, they nodded as I repeated the words they clearly knew so very well. We bowed our heads and prayed as one our Lord's Prayer and then I circled the room and pressed the tiny wafer into the hungering hands of a grieving family. And yes, since they asked me to, I gave a bit of wafer to Carmella, too. Did she realize then the gift that hers was to receive once more in this life? I'm told the dying comprehend more than we often give them credit for and so I expect she did know. I know it was great comfort to her children that together with her family she might have one more taste of the Living Bread that is Jesus. And so it is we hear of Jesus as Living Bread again this week. I know there are a thousand, thousand ways to encounter Jesus and I know also that the story I just told is probably an example of how we who are deeply churched most expect to encounter him. Only I didn't expect it in quite this way when I walked in to that hospital room that morning. I didn't expect it would be shared across so much which would otherwise separate us: language, culture, and faith traditions, to name a few. And I certainly didn't expect they would be so eager to receive this bit of Living Bread even from me... So in this once more I am reminded of how this Bread that is Jesus brings life also in surprising places and between unexpected people: binding us together across all that would separate us. And I am reminded again that this gift of God IS ours to receive, to celebrate, in the simple example of one small child in the congregation I now serve -- this gift of God is ours to eat, to take into ourselves, to change us from the inside out, giving us life and energy and hope for another day. Like the bread we enjoy every day, this Bread does the same only more for receiving this Bread has us abiding with Jesus who is the source of life and hope itself. What are your favorite stories of Holy Communion? When have you been surprised by the wonder of the Living Bread that is Jesus even in this traditional way you are accustomed to receiving it? Can you think of times when the Sacrament has brought together those who might otherwise be separated? How do those experiences deepen your understanding of the gifts of God? I am grateful to be part of a faith tradition which urges me on to be an instrument of feeding all those who are hungry for the gifts of God. The Lutheran family I call home practices an open table. All are welcome. Because of this I did not hesitate to fill my communion kit and return to the hospital that day. I imagine there might be those who disagree with what I did. What do you think? What would you have done? Why? Click here to leave a comment or read other comments... 8 Comments so far. "The Boy Next Door: On Another Senseless Shooting"
In the avalanche of news about yet another mass shooting in our country --- this one in a Sikh Temple south of Milwaukee --- I find my mind and heart automatically travel back. For you see, it happened here in my community not that long ago. A heavily armed gunman entered a classroom leaving lifetimes of grief and suffering in his wake. I will not ever forget that day turned into night turned into day again. The call that came saying there had been a shooting. The sound of sirens coming from all directions. Hurrying back to church searching for news online. Rejoicing to hear none of our own had been wounded or worse. Pausing then in the sobering truth that others were not so fortunate. Standing with students by candlelight on a cold February night outside the Lutheran Campus Ministry building. Marveling to listen as a Jewish student voiced his grief in the ancient words of his faith. Traveling late to the hospital and standing with one family huddled together as they received the unimaginable news that their daughter who had survived a tour in Iraq had been murdered in a college classroom in DeKalb, Illinois. Those images, those experiences flood back whenever the headline of another senseless shooting reaches me. A friend, a member of the congregation I was then serving, is the Director of Emergency Services at our community hospital. While dozens and dozens of courageous people were about saving lives that day, her staff walked into some of the worst of it. It was the end of the day --- or actually it was in the early morning hours of the next day. The wounded had been tended and had gone home with families or sent on for surgery or other needed interventions. But there were still six dead young people: five students and the gunman himself who had turned his ammunition on himself. There were families waiting to see them, to make final identifications, to go deeper into the grief that was already gripping them. One may not at first think of these things but Cindy did --- knowing that someone would need to clean up their bodies so as to at least ease in some small way the horror that was waiting their families. And so she did. She said she didn't want her staff to carry those memories and so one by one she went into room after room after room and wiped away the blood from their wounds. She did so for the shooter, too. Later she said he looked like the boy next door...not some monster capable of inflicting such senseless suffering. The boy next door. As I remember that I find myself also thinking of those who were trying to make sense of who Jesus was in our Gospel lesson today. For they saw him only as the 'boy next door.' I expect it would not have occurred to them to look at Jesus and think of him as someone capable of great evil --- just as in the same way they looked at him and could not imagine he was somehow so very connected to the gifts of heaven itself. They were inclined to simply dismiss him as just another like all the rest of them. And I expect they were and are not alone... all too often we do still dismiss one another, unable to grasp the great potential and promise lying just beyond reach. Perhaps we do that with Jesus, too ... especially in the face of such seemingly insurmountable problems. For I say this in all truth. I hear news of the kinds of shootings we hear of again in these last days ---- at a midnight showing of a movie in Colorado --- in a Sikh Temple outside of Milwaukee --- and a great sense of helplessness overcomes me. As I have stood with those who grieve such senseless losses before, I find myself aching as I imagine the pain being felt by so many today. And yet it seems to me there must be more than empathy for us to offer. Yes, even more than walking in and picking up the pieces and wiping up the blood to ease the suffering of those left behind in some small way. And while you can probably imagine where I might stand on the whole gun control debate, if I can't change that, mustn't our faith, our following Jesus, still make some difference in all of this? And maybe that difference is simply this. Every one of those who grew up into those who would pack up an armory of weapons and ammunition and inflict such violence --- every one of them was someone's child, confirmation student, team member, student, next door neighbor. So perhaps it simply comes down to this: maybe I need to begin to take a second look at the boy, the girl next door. Maybe I need to begin to see all those I encounter --- in my office, at worship, at coffee hour, in the grocery line, at a high school football game, on the bike path, in the car next to mine at the stoplight ---maybe I need to see all those I encounter as those who hold all the potential in the world. To SEE them, not with a heart made dull by indifference or quickened by fear but rather with a heart full of wonder, and curiosity and hope. To see us all as bearing the very face of Jesus, for in fact we do. And then to begin to act like this is so. Now I am not so naive as to believe that my attention or my care alone can alter the path of the sort of insanity which results in the kinds of tragedies we have witnessed of late. Still it might make a difference for one who could bring the gifts necessary to do so. At the same time, I know that the stigma attached to mental illness still leads many families to live with it in heart-breaking silence. Isn't it finally time to break that silence? Indeed, what difference might it make if all of us made only a little more effort to reach out --- especially to those who make themselves distant? Perhaps only one more effort might just lead to the intervention that could make a difference. Or maybe, just maybe, all of our attention and care might together just lead to a whole culture doing what needs to be done so that never again will our neighbors and friends have to clean up the blood of those so senselessly killed. So that never again will families need to live the nightmare of identifying the body of one shot by a stranger in a movie theater, a classroom, a place of worship. And yes, so that never again will another family have to live with the terrible knowledge that their own 'boy next door' did the unthinkable. What does our faith call us to in response to such events as the shooting at a Sikh temple south of Milwaukee? What difference are we called to make in a world where such violence happens all too frequently? I am deeply aware that my proposals above appear to be so very small in the face of such huge challenges. To be sure, 'one at a time' solutions are not enough. Still, they are something. Can you see how simply encountering one another fully --- being in community for and with one another --- might make a difference? Why or why not? If not, what more might you suggest? I have been baking bread for as long as I can remember. It was a regular occurrence at the home I grew up in: the aroma of fresh baked bread. It was, I'm told, an even more regular happening in the home my mother grew up in back in the time when bread could not be bought as easily as it can be today. My grandmother, whom I never knew, baked bread. My mother baked bread. And so do I.
fun tending the sponge of a marvelous rye bread on the back of my stove --- While bread can be exotic, it's also pretty basic. All you finally need is flour, a little salt, yeast, water, and maybe a little sugar or other sweetener. Patience and a decent oven help, too. Still, all in all, bread is pretty ordinary. Every culture enjoys some form of it. In fact, I understand that for more than 6,000 years, people the world over have been baking bread. And so it is that Jesus offers us today the image of bread as a way to better understand him. Indeed, his first listeners wondered, too, at the ordinariness of the man whose message they had come to hear. They wondered at who he thought he was --- this Jesus whose parents they knew so well. They wondered how one so much like them in so many ways could begin to think of tying himself to heaven when he says, "I am the bread that came down from heaven." Indeed, no doubt they wonder, too, how it is he can make such extraordinary claims about something so ordinary: claiming to be the bread which will satisfy hunger and quench thirst for all of time. It is how God always seems to work, of course. Oh, there are plenty of extraordinary things which happen in the presence of Jesus, but in the end, God uses fairly ordinary means to reach us. We experience this over and over again in many of Jesus' teachings. Consider, for instance, his parables where he speaks of things like seeds and weeds and crops and vineyards and lost coins and travelers and families: all so very familiar to the people who first listened to what he had to say. And today, of course, he brings to mind the nearly universal image and experience of bread. Indeed, God employs ordinary means to help us understand, embrace and rejoice in God's love for and intent for us all: including Jesus himself, whose childhood, no doubt mirrored those of his neighbors. For of course, it is the ordinary we understand best. And by God's wondrous gift, it is the ordinary which the Holy somehow permeates and makes new --- in always extraordinary ways.. Whenever I bake bread I do so remembering so many. A grandmother I never knew and the large family she made sure were fed. An aunt whose house always smelled of fresh baked bread whenever we dropped in. My mother who taught us to knead and shape the loaves and who looked the other way when my sisters and I would playfully toss the dough to one another before placing it in the bowl to rise. All these women: simply ordinary people finding life in a tradition which helped sustain life at their tables. 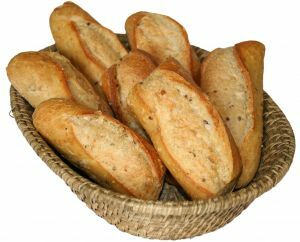 And of course, we are all so very privileged to think of Jesus, too, who compared himself to ordinary bread. And in doing so gave his listeners something to chew on. So that now all of our bread can speak to us of the promise of so much more than something to sustain us today. How does the image of Jesus as the Bread of Life speak to you? 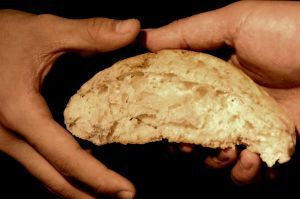 What stories of 'bread' make Jesus' words today all the more meaningful to you? Why do you think some of his first listeners were not able to understand or embrace his teaching? Have your questions ever mirrored theirs? Why or why not? What other examples can you think of where God used ordinary means to reach God's beloved people? Where have you experienced the gifts of God in the 'ordinary' in your life?